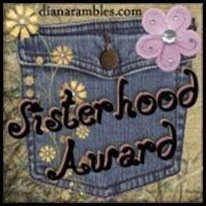 First of all, thank you Meinsideout for the blog award. In all honesty, I did receive it previously and you can read about that post here. And thank you for the kind comments of support and excitement for our BFP! There were several lurkers out there that commented and it's great to "see" you all. On another note, I've received some new followers that I've made the decision to block. After reviewing your profiles, if I find you don't have any connection whatsoever to my blog or the topics discussed here, I feel it's in my best interest to block your interaction. I apologize for this, but it's not rated for all audiences. If you have been blocked and would like me to unblock you, please send me a comment explaining why. Comments on my blog must be moderated by me and therefore, I will keep your comment private. Ok, back to this stuff. I have some other posts I'd like to whip out one of these days, but for now, I'll just skip to the facts. Because it's what you've been waiting to hear, and well, what I waited to hear ALL day yesterday. Body Temp: Cold, all the time. Sleeping in long pjs with 3 blankets. Crazy for me! YAY!! so very happy for you!! what is next? another beta? or US? And I love the cravings! Nugget is flying off the charts! Hurray for a beautiful second beta! I admit I was holding my breath and glad you didn't make us wait too long. Glad you're feeling well and symptoms are not overwhelming you. Congratulations and yes, lots of gratitude and joy! Wow, graphs and everything, that definitely makes it official. Looking forward to hearing continued good news. FABULOUS!!! woo hoo!!! When is your first u/s scheduled? K, that is the best news that we (all of us in blogland) could have hoped for! Congrats again! Love the chart. That is truly cool stuff and congratulations on the great beta. I'm hoping all good things for the ultrasound that will be soon soon soon. Oh, and I LOVE "nugget" very very cute. congratulations K! this is so great. K, today you were officially moved to my "IF SUCCESS" folder of blogs! Congratulations on a great beta! I'm so happy for you.